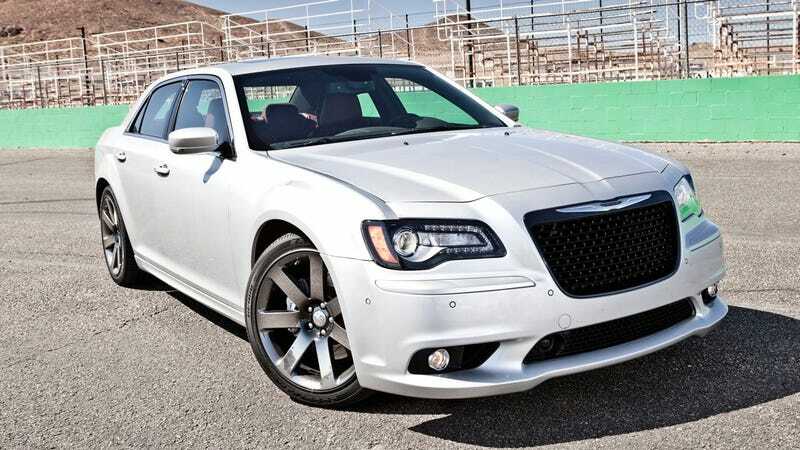 Here's the weird thing about the 2012 Chrysler 300C SRT8. I did my fastest lap around Willow Springs in this limo, according to SRT's new Electronic Vehicle Information Center. That's a console-screen app whose "performance pages" provide readouts on 0-60 mph time, 60-0 mph braking, G-forces, one-eighth mile and quarter-mile times. I'm owing that to how planted the 300C felt through Willow's dreaded turns eight and nine, the first a 100mph+ sweeper, with a hint of lumpiness that would make Surtees' knuckles blanche. The second is a decreasing-radius widowmaker, known to toss unsuspecting wheelmen into a concrete wall nearby. Of course, the extra confidence could have been a function of the XM-borne hair metal blasting from the 300C's 900-watt, 19-speaker Harman Kardon audio system. It works for fighter pilots. The 300C and Charger are brothers-in-wheelbase, but I happen to think the 300C is the best looking of the bunch. Click here to go back to the 2012 Hemigasm!